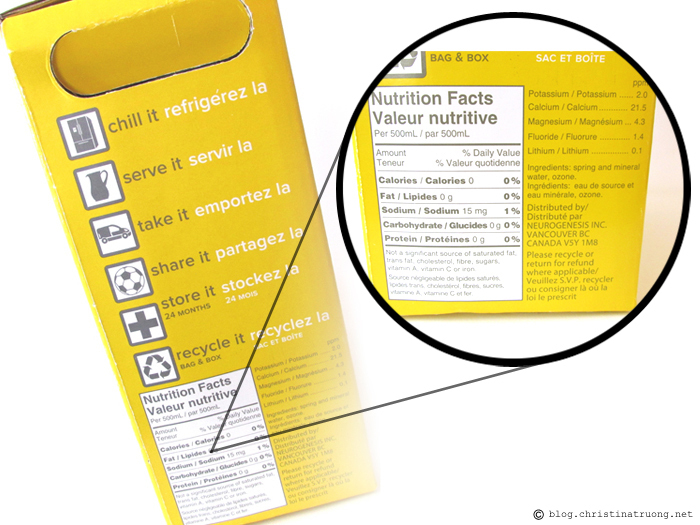 Sourced and boxed in British Columbia, Canada. The Happy Water WaterBox is 100% recyclable and BPA free. 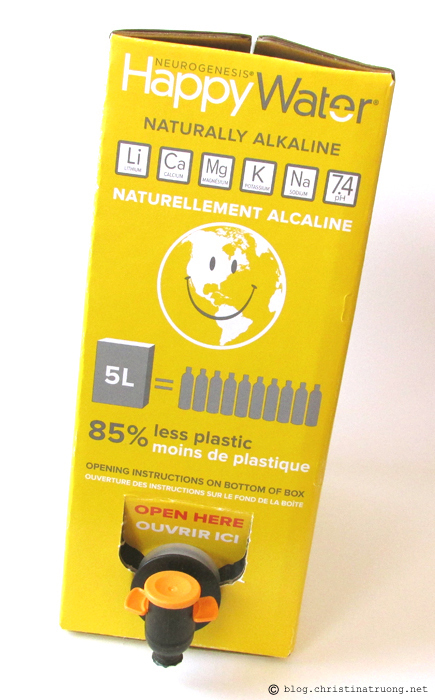 It will help reduce your environmental footprint with 85% less packaging than water bottles (500mL). The box is portable so it can be enjoyed anywhere and don't worry about spillage, the spout tap is designed to not cause leakage and control portion. Tap, bottled, filtered, not all water "tastes" the same. Sure water shouldn't have a taste in the first place but you'd be surprised. I try my best to avoid bottled water, some brands more than others. I'm very picky when it comes to the water I drink, I normally boil my tap water and go from there. It's hard to describe but I like a clear clean tasteless "taste". 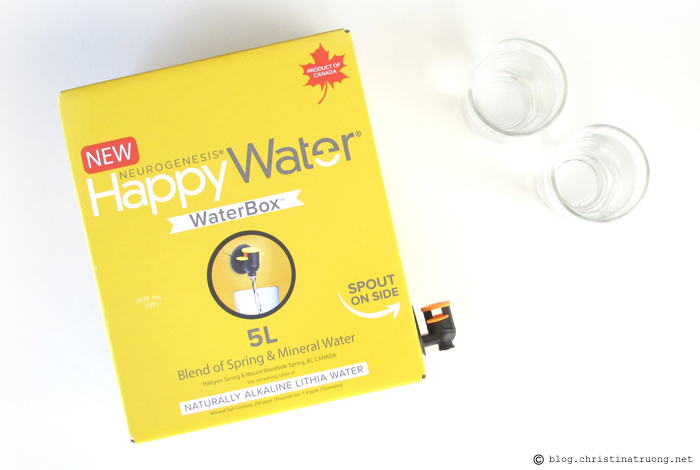 When I was asked to try Happy Water, a part of me was skeptical but the other thought it sounded promising. I gave it a try and let me just say, we have a winner! It reminds me of the water I regularly drink (boiled tap). Perhaps slightly better?! Maybe it's all in my imagination but the water runs downs smooth, felt clearer, cleaner and crisp. Comparing Happy Water to just water straight from the tap, there's obviously a difference (see comparison photo). The WaterBox is super convenient. Because it's a box, you can stack them into your car or in storage without any problems. It fits in the fridge perfectly - doesn't take up much space. And the spout does a great job not causing any leaks and spills. Overall, if I ever need to bring water for an event or trip or in need of a bottled water, I know what I'm picking up. Happy Water will be my number one choice. 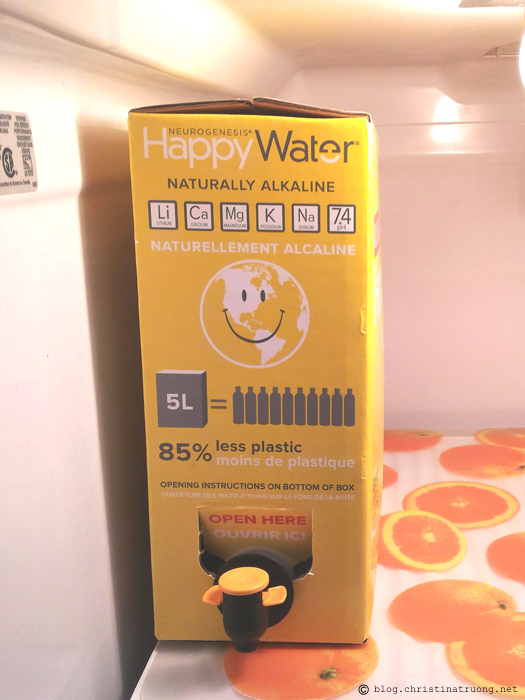 Refreshing, convenient, environmentally friendly, it's amazingly happy! 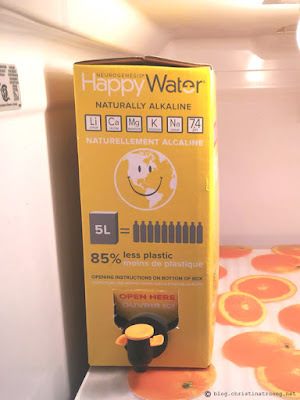 Great review of Happy Water! Thanks!